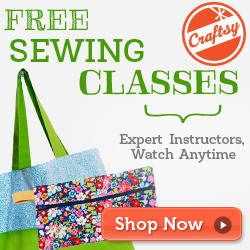 I am really loving the Craft Lightning Series sponsored by my favorite bloggers, Angie at Country Chic Cottage and Carolina at 30 minute crafts and this current version, Teacher Appreciation, is no exception! 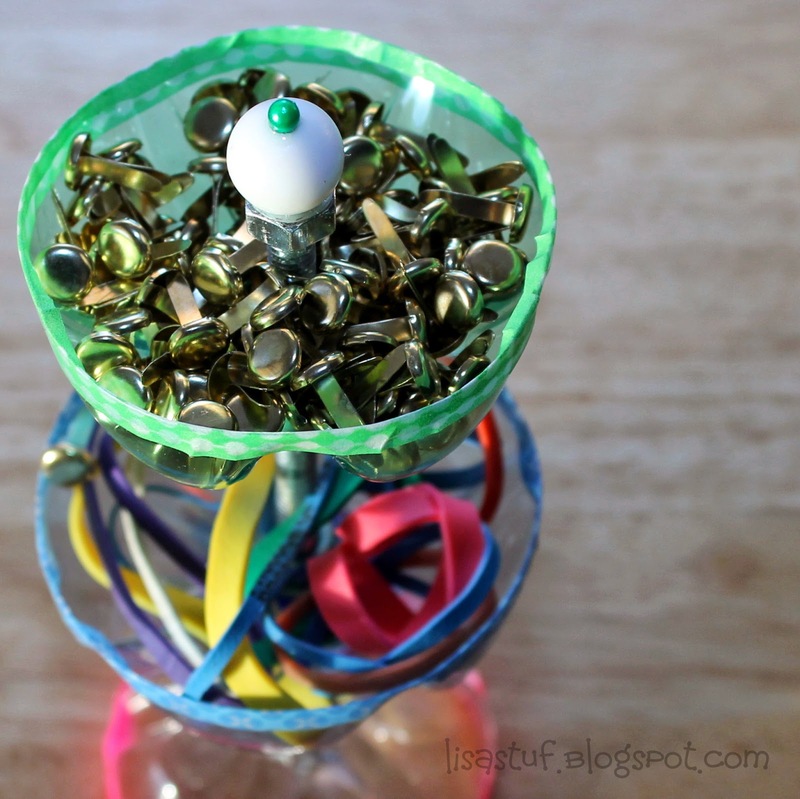 I am always trying to do 10 things at once and am never very successful in getting things done, so finding a craft I can do in 15 minutes or less fits right in with my daily madness! As my previous visitors and followers already know, I babysit two of my Grandchildren on a regular basis and one of them is in school and she LOVES to make things for her teachers, so I decided to be sure and make a teacher gift every year for her to give to her current teacher. Last year, I made this personalized coffee container for her Kindergarten teacher and it was a hit not only with Little B and her teacher, but with the entire class! I don't know if this project will be quite as popular as that one, but since I've been on a "recycle/upcycle" trend lately, I decided to continue with that theme and try to re-use something in a creative way. 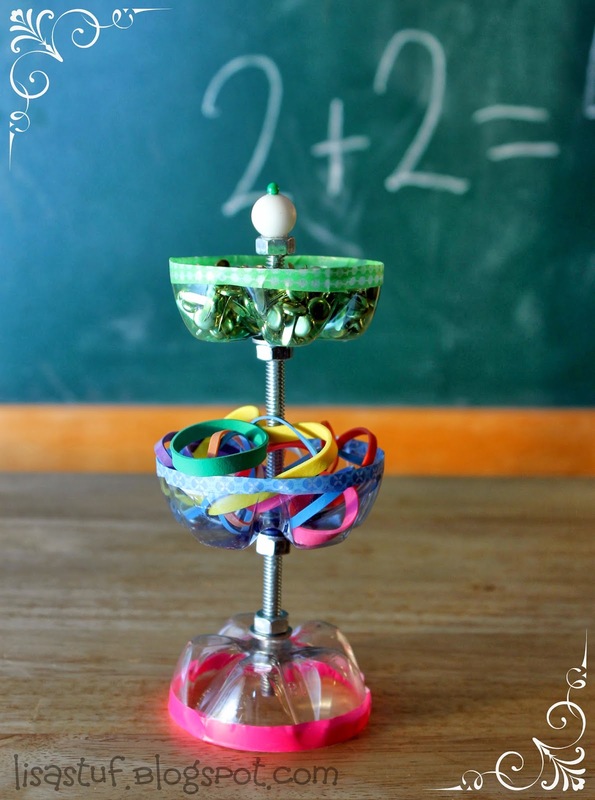 I had seen a very cute idea on either Pinterest or Stumble Upon recently and wanted to re-create it but wasn't sure if that exact item (A jewelry holder) would fit for B's teacher, since I do not know a whole lot about her and what she might like, so I decided to down-size it and make it for use on a teacher's desk. So, I made this desk organizer (paper clip, brad, rubber-band holder). 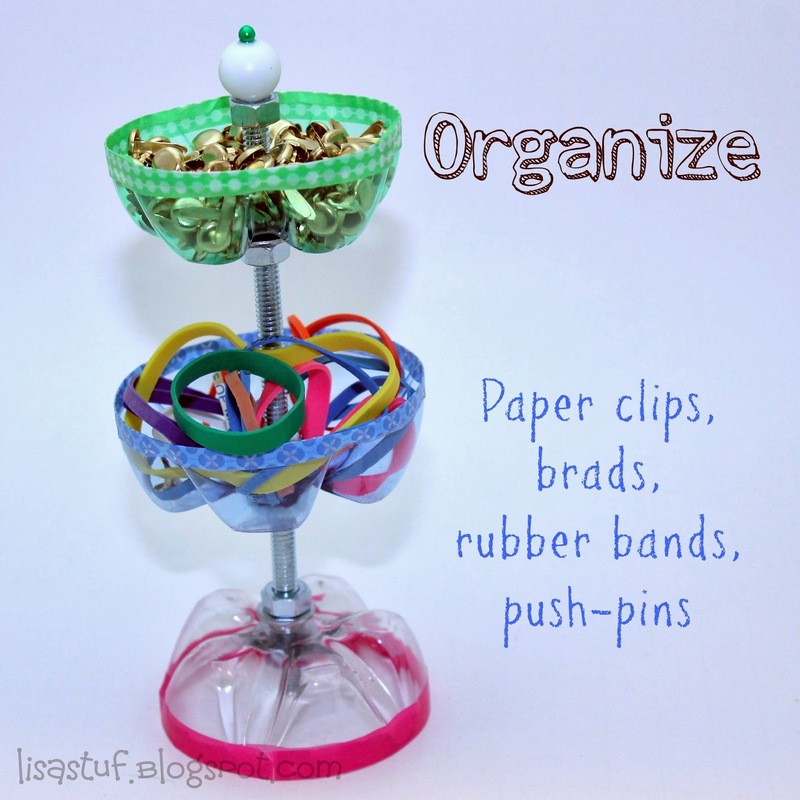 I tried to think of what little items a teacher would use that would need to be organized for quick use on her desk and I came up with paper clips, rubber bands, brads and push-pins. 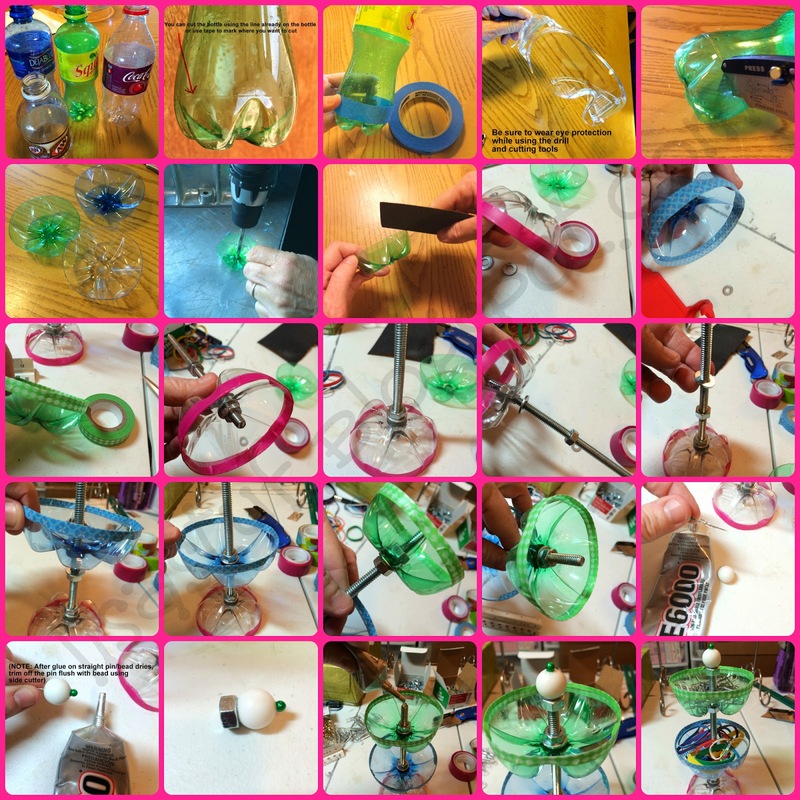 I used 3 empty plastic soda bottles (12-20 oz.) for this organizer, but you could make yours bigger and/or smaller depending on your taste and what bottles you have on hand. 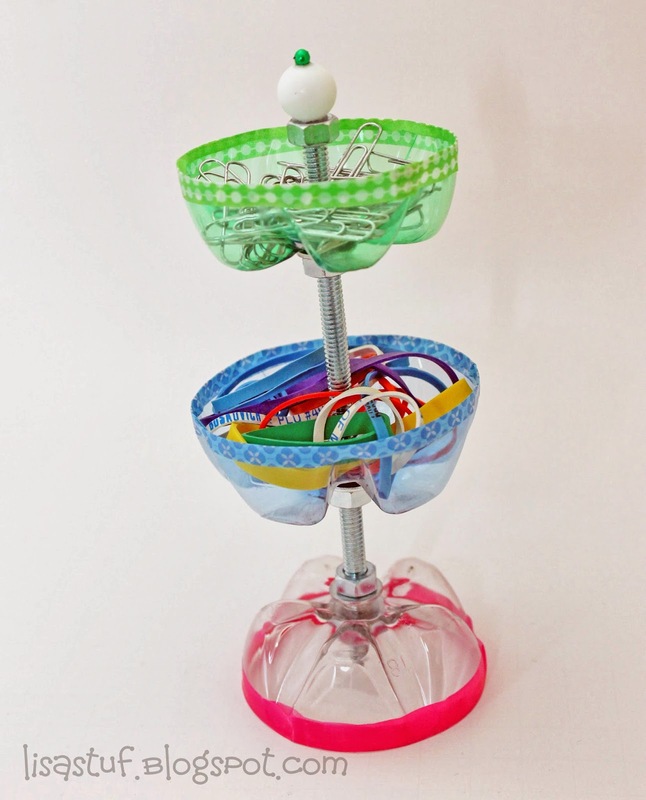 One of the great things about this project is you can almost make it from stuff just around your house and in your craft stash, especially if you have a hubby with a garage or shop! Oddly enough, my husband has a garage stock full of hardware and tools, but since he wasn't home at the time I started my project, I couldn't find some of the hardware I needed, so I did run to the corner hardware store real quick and pick-up the threaded rod, washers and nuts, though I'm pretty sure he had most of that hidden somewhere in the dark corners of his man cave! When he got home, I had him do the drilling for me, even though I attempted it with my 25+ year old dremel too, but it finally gave up the ghost, just as I was drilling my first hole, so I had him finish the others for me, as I was not sure I wouldn't drill my finger trying to wrestle with the bigger drill! 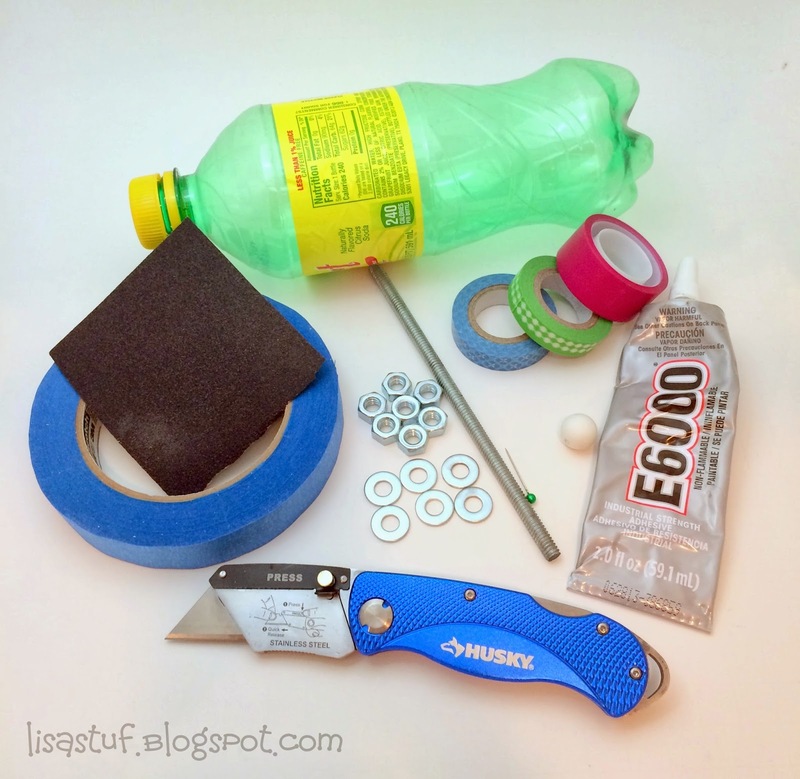 I noticed that most plastic bottles have a built-in line around them right about where you want to cut, but if you prefer a deeper dish/bowl, then just mark the bottle with tape and then cut it with the utility knife. I sanded the edges of the plastic after I cut just to smooth them out a bit. I decided to add some washi tape to the edges also, mostly for color and decoration, but this is not necessary if you sand them smooth or unless you just want to dress them up a bit! After attaching all the pieces using the washers and nuts I decided to add an embellishment to the top, to make it look a little prettier! I used a plain white bead and inserted a straight pin with a colored ball tip and glued them together with E6000. When it dried, I just snipped off the excess pin and glued the embelli to the top of the threaded rod. 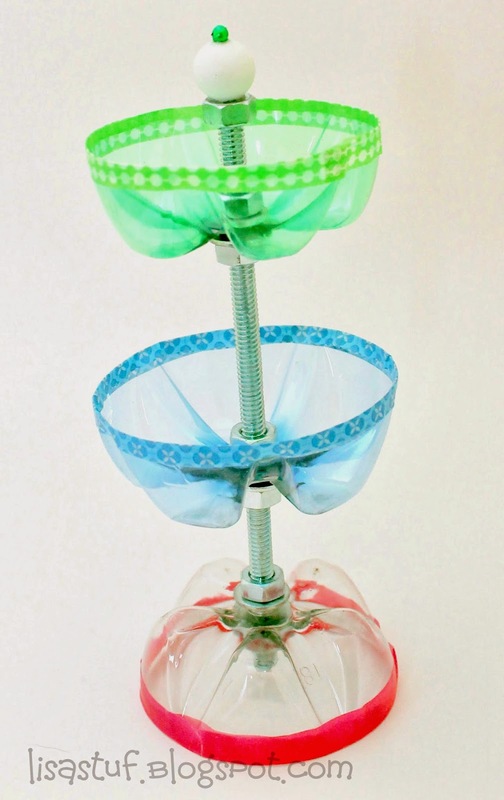 This project was so easy and inexpensive...and it turned out pretty cute for a recycled project! 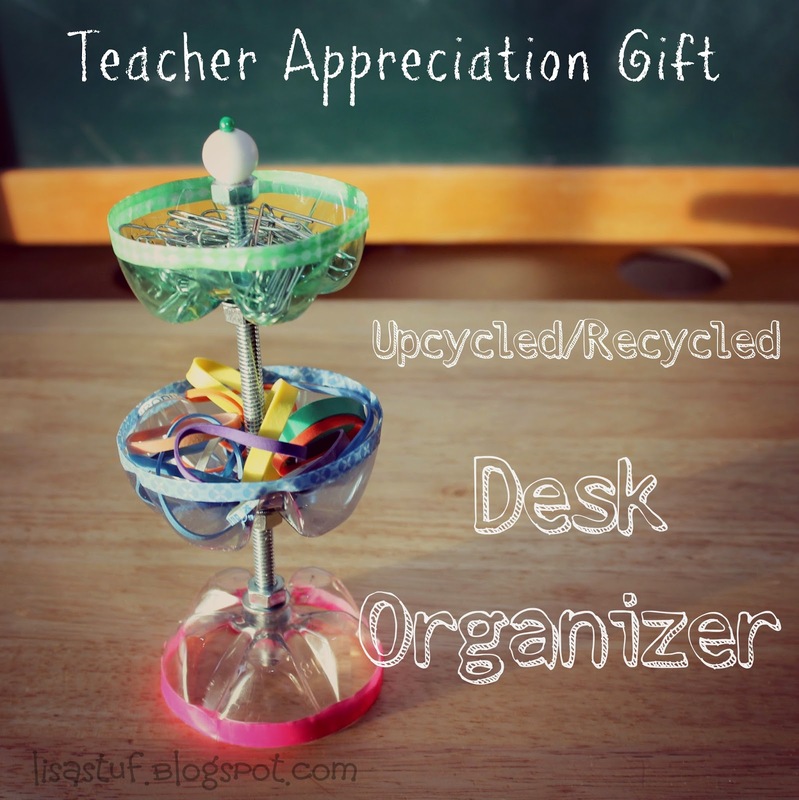 Hope you like it and might want to try making one of your own or for your favorite teacher! If you get a chance, check out her photography site, she is very talented and I'm so proud of her! Also, a big thank-you to Angie and Carolina for once again allowing me to be part of this awesome blog series. It's always so much fun and so much inspiration to be shared! 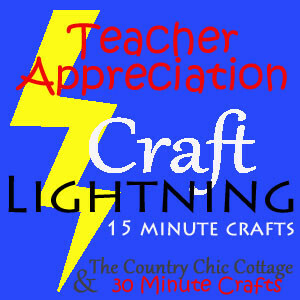 Be sure to check out all the great Teacher Appreciation projects in this Craft Lightning Series. Angie and Carolina will be posting round-ups of all the projects each day!